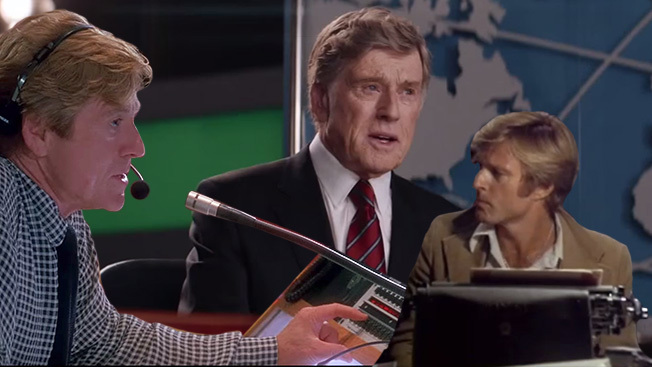 Are Robert Redford’s Movies About the Media Good for Journalism? Robert Redford has acted in dozens of films in his career and directed nine others, but there's one subject he doesn't seem to tire of tackling: journalism. Since Redford played Bob Woodward in All the President's Men, he has revisited the profession several times on-screen, both as an actor and a director. And he's at it again this week, portraying Dan Rather in the new film, Truth, which opens Friday. Redford told the BBC in 2012 that while journalism "had reached an apex of morality and professionalism" when Woodward and Carl Bernstein exposed the Watergate scandal in the early '70s, "I think it's pretty obvious it's declined since then—but I didn't imagine at the time that it would decline so steeply and drastically, that the rules that governed journalism—like you had to get two sources to go on record before you could quote them—would be gone. The tools of responsibility were dismissed in favor of the quick scoop. I think that has damaged journalism." Who he played: Washington Post reporter Bob Woodward, who teamed with fellow reporter Carl Bernstein (Dustin Hoffman) and uncovered the Watergate scandal, which ultimately brought down Richard Nixon's presidency. Was it good for journalism? Without a doubt—the movie, which won four Oscars and was nominated for eight in total including Best Picture, shows journalism at its finest and is one of the best films about the profession ever made. Who he played: Local Miami news director Warren Justice (yes, that seriously was his name), who turns a fledgling TV journalist, Sally Atwater (Michelle Pfeiffer), into a national star while also falling for her. Was it good for journalism? Sort of—Redford's Justice is filled with integrity and is incredibly smart about taking Pfeiffer under his wing and teaching her what it takes to make it in TV news. ("If it bleeds, it leads.") But Up Close and Personal was initially supposed to be a hard-hitting movie about the late TV broadcaster Jessica Savitch. Instead, it morphed into a Pfeiffer-Redford romance, jettisoning all of the controversial elements of Savitch's life—including her alleged drug abuse, physical abuse and tragic death at 36. Its Oscar-nominated song, Celine Dion's "Because You Loved Me," ultimately overshadows most of the movies memorable moments. Who he played: Redford directed the film and also portrayed a college professor who inspires two of his students to enlist in the Army after graduation and fight in Afghanistan. This time, Redford leaves the role of journalist to Meryl Streep, who plays Janine Roth, a liberal TV reporter interviewing a Republican presidential candidate (Tom Cruise) about a new Afghanistan war strategy. Was it good for journalism? Not really—Streep realizes she is being used, as Cruise wants her to sell the American public on his plan and help facilitate his run for president. She expresses her doubts about the war strategy to her bosses and wants her story to reflect that, but in the end, the finished product is the puff piece Cruise wanted. It's unclear whether she caved or quit in protest, but neither reflects positively on the state of broadcast journalism. Who he played: Redford directed the film and starred as Jim Grant, a onetime Weather Underground militant wanted for a 1980 bank robbery and murder who has been hiding from the FBI for 30 years. His identity is exposed by a cocky young newspaper reporter (Shia LaBeouf), whose story triggers a manhunt for Redford. Was it good for journalism? A mixed bag—LaBeouf's write first, ask questions later approach reflects Grant's cynical attitude toward journalists (this guy certainly isn't anything like Woodward), though the character does somewhat redeem himself in the end. Who he plays: Dan Rather, the longtime CBS Evening News anchor. The movie is based on former CBS News producer Mary Mapes' memoir about her and Rather's 2004 60 Minutes II investigative report which appeared to uncover new evidence that President George W. Bush failed to fulfill his service as a Texas Air National Guard pilot from 1968 to 1974. When the documents later appeared to have been forged, the focus shifts from Bush to Rather and Mapes, and in the resulting fallout, both of them ended up leaving the network. Was it good for journalism? No way—while All the President's Men reflects one of the country's great journalistic moments, Truth focuses on one of its blackest eyes. The ultimate truth of Mapes and Rather's segment was rendered moot, overshadowed by the controversy that ousted them both from CBS.